For those that have been waiting for a 3ds Max version of Emily 2.1, she is now available. You will require 3ds Max 2014 0r later. 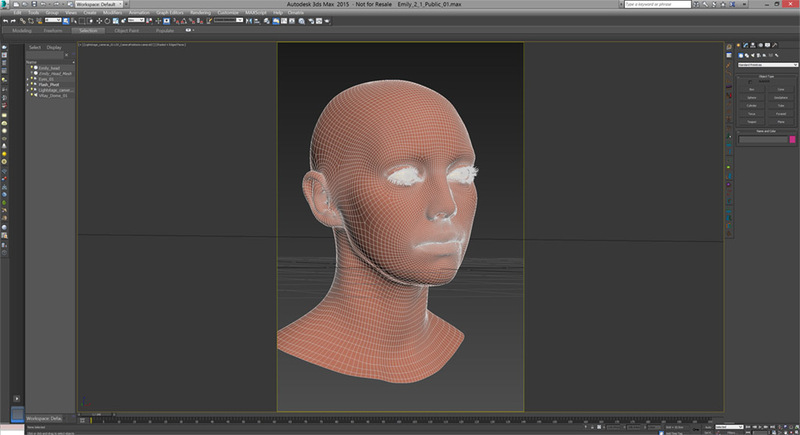 The shaders are currently set up in V-Ray 3.2 for 3ds Max. Are you sure this file is a 2014 (16) version and not 2015 (17)? Just downloaded this, does not open in max 2014 SP5. Error says File save version is 17000 and my max is 16000. Thanks for the feedback. We will check versions and update the data. Thanks for your comment. We will have to look into this. Can you please email me more info and details of the crash at labs[at]chaosgroup[dot]com? This is amazing quality! Thanks so much for sharing these files. I’m wondering if you could provide more info on how the tex maps were made? I’ve tried duplicating the shader tree with my own model and textures, but the results are not even close to what you are getting. So I’m guessing that the tex maps are pretty finely tuned. Cheers! The maps are generated from the ICT scan. They are calibrated to be the correct color based on that shader, and vice versa. If you use them as a basis for your own color and intensity, you should get a better match. Hi guys, please update the Emily 2.1 Max link to read 3DStudio Max 2015. As you guys know its not a 2014 file. It is a Maya Ascii file, so it is readable text and some browsers just display the text. If you right-click and save the .ma file you should be able to read it in Maya. Thank you sir! you’re my ! one last questions tho. it might sound stupid but im just a beginner. now since i can open the scene i should download the maps and link it to the shaders ,right?